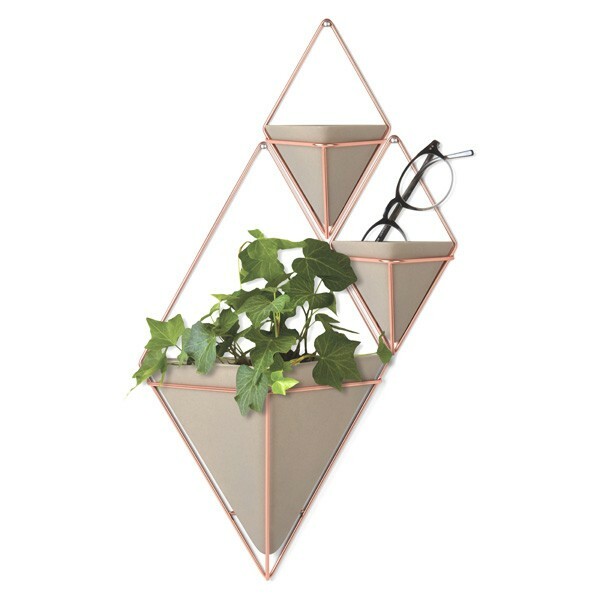 Get on the geometric style bandwagon with these gorgeous diamond-shaped wall planters! The Umbra Trigg Wall Vessel Small - Copper - Set of 2 comprise two concrete resin pots hanging from copper wire frames, which can be used as plant pots, or for everyday storage, such as stationery or makeup holders! These multi-purpose wall storage vessels are both aesthetically pleasing and practical, and make great talking points in your interior. The diamond shapes of these funky planters lend themselves to group arrangements and creating an eye-catching feature piece on any wall! Plus the Trigg is also available in a single larger vessel (see on the right), which looks particularly effective when arranged in a wall display of small and large vessels! This design-led storage solution is perfect for modern interior spaces, and would also make a stunning housewarming gift for creative spirits! Really small. Could only be used with faux plants. Much smaller than expected (my fault for not reading description) but well made. They were bought as a present and she loved them!